Guys, this recipe is a game changer. Back in my very first recipe blog post (click at your own risk), I shared that sushi (along with cheese!) is my favorite food. I know, I'm so basic. Since I'm a big fan of eating food that you love, I eat sushi on the regular. And probably, I'd eat sushi everyday save for the fact that I'm kinda a snob when it comes to good sushi. Which, I guess if you're eating uncooked fish is a pretty good thing to be. After I go to Japan in less than a month, I have a feeling I'm going to return even more of a sushi snob. I'm actually a little scared...what if I can't eat American sushi anymore after experiencing sushi perfection??? But seriously, as I've researched Japanese food for our trip, I have been absolutely fascinated learning about the art of sushi. What was most surprising to me was learning that in Japan, it's actually the rice that distinguishes really good sushi. Super fresh fish is so plentiful that you can get it even in inexpensive, hole in the wall joints. The true sushi masters, the ones who command $300 for a sushi tasting, are the ones who have mastered the art of making perfect sushi rice. Y'all, it's a lot more than throwing some white rice in a rice cooker. In Japan, arguments break out over the merit of a few extra drops of vinegar in sushi rice - it's serious business! It's said that in the best sushi, all the rice grains point in the same direction. My takeaway? I'm not even going to try and cook legit sushi at home. There's no way I can come close to replicating that level of skill. So I'll stick to my sushi bowls, nori wraps, and now, the avocado sushi cup! Carbs, I promise I still love you. But avocado, you (clearly) have my heart. 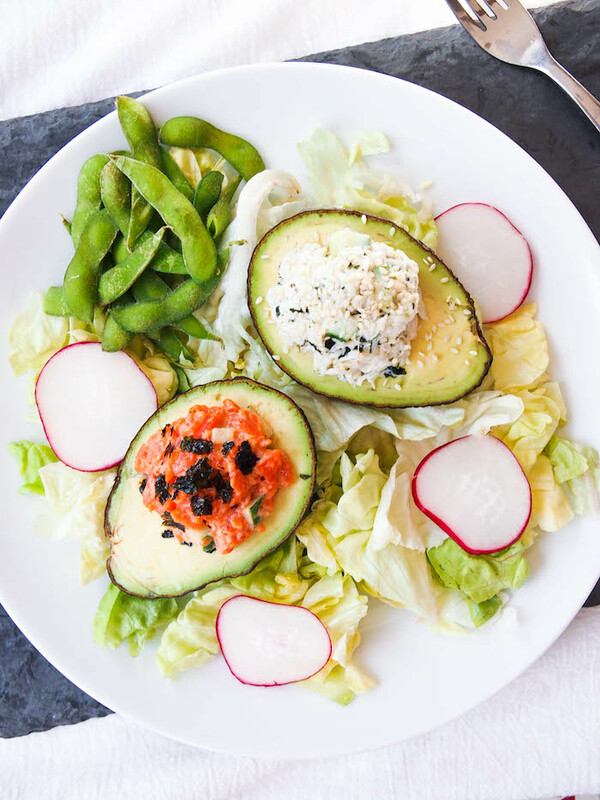 These little avocado sushi cups are so easy to fill with your favorite sushi ingredients. And you can get really creative replicating your favorite sushi recipes in avocado cup form. For these, I stuck with classics and made a California roll (err, cup) and spicy smoked salmon. I served the sushi cups on top of a salad drizzled with my soy-miso dressing and it was crazy filling with all that yummy avocado fat and protein. This would be a really fun dish to serve for entertaining, just be sure to brush the avocado with lemon juice to keep it from browning. Are you done with diets and sick of feeling crazy around food? Ready to make peace with food and learn how to eat in a way that nourishes your body and soul? 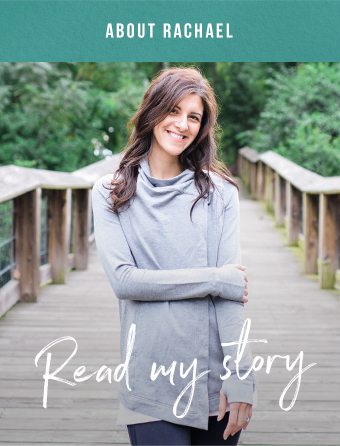 If so, I work with clients one-on-one, helping them rediscover the joy of eating, and I would love to work with you too! Click here for more information. In a medium bowl, mix together crabmeat, cucumber, nori snacks, mayo, soy sauce, lemon juice, and wasabi powder until well combined. Season to taste with salt. 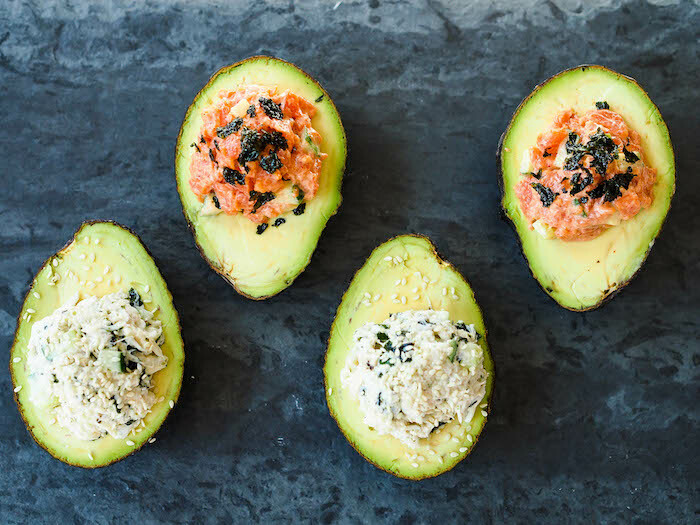 Stuff crab mixture into avocado cups and serve. In a medium bowl, mix together salmon, cucumber, mayo, and sriracha. Season with salt to taste. Stuff into avocado cups and garnish with nori.